12 student from years 7,8,9 and 11 took part in the schools race at the Woking round of the tour series. First up was the year 7,8 and 9 race in which there where two teams from Winston. Ben Bishop lead the first time to second after the first lap, before Daniel Harrington stormed away to give Winston a 300m advantage going into the third lap, but an unfortunate crash caused by a wet road surface meant that Dan Swords was unable to finish his lap so the team did not finish although the final man Ieuan Woods was still allowed to do a lap of the course. The second team rode consistently throughout the race to finish in the middle of the group. Next was the year 10-13 race in which there was one team from Winston made up of year 11s. The first lap by Will Bloxsome put the team in the middle of the race, Joe Martin than kept the team in 6th place. The third lap from Scott Porter placed the team in 4th place behind two teams from Gordons and one from SJB. Kieran Woods then took up the final lap and closed the gap to second place Gordons and brought the team to second place. 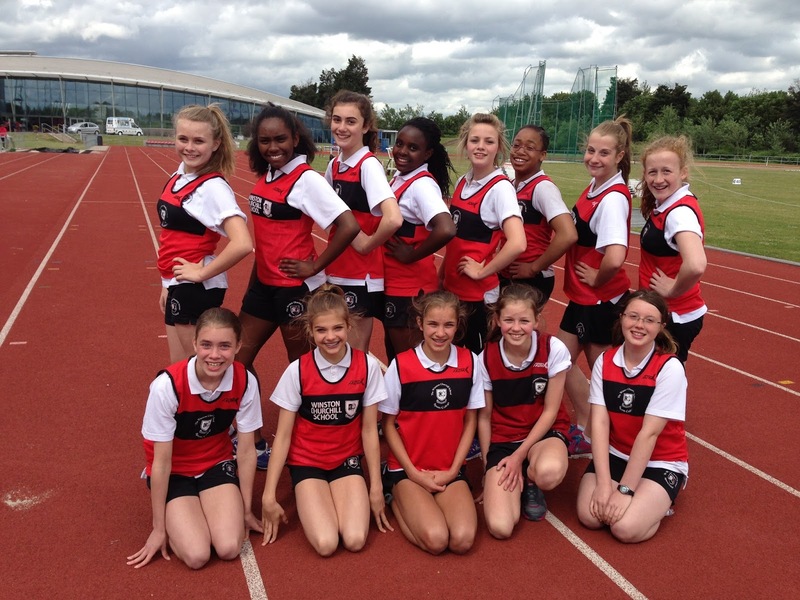 The Y8 Girls Athletics Team (Ellie Sharpe, Paige Hewitt, Millie Cave, Ana Richardson, Rosalind Milbourn Katie Warren, Sarah Bindschedler, Tasmin Martin-Young, Ella Barbato, Victory Ogubuike, Charlotte Gray, Annie Parkin , and a talented Yr7 Amanda Chimbima) competed in the regional round of the English Schools Athletics Competition last week and demonstrated excellent potential. The competition was an extremely high standard and our girls stepped up to compete against some of the toughest teams in the regions. To name a few performances on the day, Ellie Sharpe had a successful day competing in the 75M Hurdles running 14.4secs and jumping 1.29m in the high jump, Annie Parkins ran a quick 200m with a time of 30.7 secs and jumped 4.15m in the long jump, and Millie cave threw a Javelin a whopping 21.27m and ran a 100m time of 13.5 secs. The team as a whole raised the bar, but unfortunately failed to qualify for the Nationals this year, however this competition has put them in good stead for the district competitions coming up in July. I’m sure the girls will continue to be committed and work hard to achieve success again next year. Well done to all the team, they all performed extremely well and I’m very proud of them.